The Order was founded by the relict of the Elector Maximilian III., Maria Anna Sophie, from her own private property, in 1784, for the benefit of the Bavarian nobility. The number of members was originally hmited to ten single ladies, after the completion of their 15 th year, who could prove their noble descent through sixteen generations. They were to live together in the establishment under the guidance of the Deanness, and perform, moreover, daily, at certain hours a choral service. Its existence under such regulations was but short, and in 1802, the Elector, afterwards King Max-Joseph IV., was induced to decree the discontinuance of convent life, especially as regarded the living under one roof. He left, however, to the inmates their allotted benefices or pensions, and even allowed them to make eligible marriages. The number of members who were endowed for life with pensions, he raised from ten to eighteen ; ten of whom (all noble born) were to receive 1000 fl. (£100) each, two 500 fl. (£50) each, and six others (the daughters of commoners but civil officers of a certain rank) also 500 fl. (£50) each. The Lady Abbess of the establishment was to be, at least, a Princess of the reigning house. The costume worn, when at Court or before the Lady Abbess, remained unaltered ; it consisted of a black garment, and of the insignia, the description of which will be given presently. The financial position of the institution rendered, however, in 1825, a further reform indispensable. By a decree of the 10th February of that year, the benefices or pensions were reduced to 800 and 400 fl. respectively (to £80 and £40). By this and other means, the administration was enabled to increase the number of the members to twenty-five in the first, and forty-two in the second class, a third of whom were to be the daughters of military officers. The present Abbess is the Princess Adelgonde of Bavaria. The costume of the Order is a black dress trimmed with lace, and a long black velvet mantle with a hood ; the hood of the Abbess is trimmed with ermine. The badge (Nos. 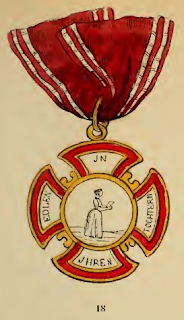 18 and 19) is a gold Cross white enamelled, and enchased in blue, with rounded sides, and golden rings in the corners. It represents on the obverse the Virgin, and on the reverse the patron Saint of Bavaria, St. Benno, both in gold on white enamel. 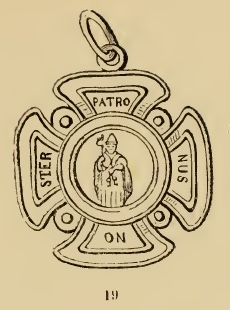 In the points of the obverse are distributed the words "Sub tuam Prsesidium" (Under thy protection), and of the reverse: "Patronus Noster" (Our patron Saint).